The functions described below are not included in delivery. The functions are made available with a free firmware update of the DCS IP gateway, they are not included in the purchase price. To use the expanded functions, a microSDHC card (recommended 2 GB / max. 32 GB SDHC) must be installed in the DCS IP gateway. With the firmware update, the DCS-IP gateway is expanded by the "Individualised message" function. In connection with the Gira HomeServer or FacilityServer, audio files can be specifically played back. In this way, e. g. status messages from the KNX system can be output via defined recorded messages at the door stations. With the "DCS communicator" software, common computers and PC-based operating devices such as the Gira Control 9 Client or Gira Control 19 Client can be used as home stations via the network connection. The DCS Communicator offers all the functions of a video home station such as accepting conversations, switching lights (in conjunction with a switching actuator), and opening doors. 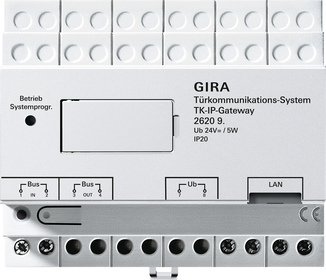 The connection to the gira HomeServer or Gira FacilityServer via a plug-in enables display in the Gira Interface. The Logic Modules enable the realisation of new application possibilities, such as access control via the Gira Keyless In products. The start-up computer must have a current browser (e. g. Mozilla Firefox, Microsoft Internet Explorer, Opera, Safari, Chrome). Integration of mobile devices with Android or iOs operating system into the Gira door communication system. "Gira DCS mobile app" is available for download from Gira or in the App Store für iOS and Android. Very high data security via "Secure Data Access" of the Gira S1. A proprietary portal by Gira can be created via the Gira device portal. With license models, please note that the DCS Communicator may be installed on any number of end devices. The number specified in the license model only specifies the number of simultaneously registered DCS Communicators. The additional power supply for door communication is required to supply power to the DCS-IP gateway. The DCS IP gateway is started up via a web interface. For start-up via a web interface, the start-up computer must have a current browser (e. g. Mozilla Firefox, Microsoft Internet Explorer, Opera, Safari, Chrome). 2 GB microSDHC card is included in the scope of supply. Windows version of the DCS-IP-gateway Finder. MAC OS version of the DCS-IP-gateway Finder. Note: The ZIP file must be extracted prior to installation. The DCS Communicator PlugIn Client in the Quad Client calls up the file „TKS-Communicator.exe“ via a parameter transfer. The events are controlled via UDP telegrams. This document describes how to set up mobile call forwarding for a door call using the Gira DCS IP gateway and the "Gira DCS mobile" app.